Ok so I am not actually melting. Just sweating to death in this flippin’ heat. So what do I do while I am dreaming of air conditioning and iced tea? 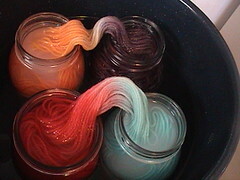 I dye yarn! Ok so this is actually the first time I have ever done it. Wanna see so far? Of course you do! Why is your yarn in the sink Momma? I am going to dye it Hun. I used my big enamel stock pot with the insert thingy (I think it is a steamer basket) for a double boiler. It seems like it took forever to heat up! 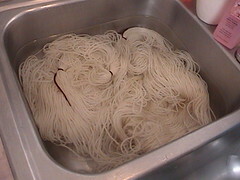 Here it is about 5 minutes after adding the yarn and more hot water to cover it. 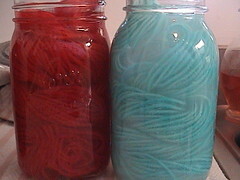 And this is 30 minutes after adding the yarn. I pulled the middles up a little to see kinda what it was gonna look like. 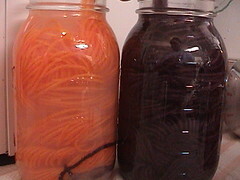 Once the jars were cooled off enough I pulled them out to see if I could speed the cooling process. I’m not impatient or anything. 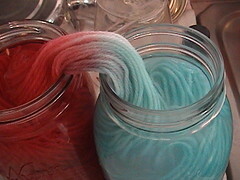 Red and blue?- Can we even call it blue? Aqua? Turquoisey? I don’t like that there is still some white left. It doesn’t look so bad here. It’s still cooling right now. I moved it to the dining room table under the ceiling fan. Again, I am not impatient. 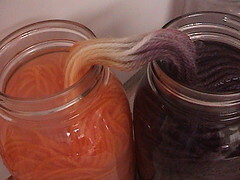 As soon as it is cooled enough I am going to give it a VERY gentle bath with some wool wash(I think it is Kookaburra? Have to look.) and take more pictures. Check back in a couple of hours to see how it turned out. Awesome! Careful, it becomes kind of an obsession. I have a box on top of the fridge filled with thirty (I am not kidding, thirty) water bottles filled with Kool-Aid mixtures. Have you discovered the elusive Tamarind flavored Kool-Aid? It’s brown, and vile, and looks like backed-up-sewer-water, and I don’t know that I’d ever be able to drink it, even if it does smell kinda good…but it’s GREAT for dyeing because of the icky brown shade; you can use it to deepen all the colors – so you can get darker blues and greens and reds and you’re not just totally stuck with Crayola colors. I LOVE me some Tamarind. Ooooooo PRETTY!!!! 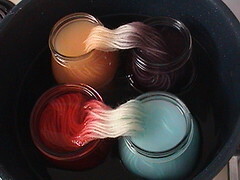 I guess I do need to send you my glass jars. Looks like you guys had fun. I can’t wait to get out there and lend a hand.